good medium length; extremely jasmine and violet, a lot of vanilla, acacia honey, coffee with cream, dark drinking chocolate, mint, lemon oil, linseed oil, light hay, slightly grassy ... marzipan and a hint of white pepper ... and buttery to the end! Nose: Shortbread and Florida Key lime pie, are the first things that hit you, followed shortly after with bananas, vanilla, and apricots that evolve into greengages. An nose that is very challenging and keeps evolving into new savours. Well it’s not really free, since the bottle turns out to be quite expensive. But this is very lovely! I totally love the taste of this dram. Again the shortbread, Key lime pie and greengages. 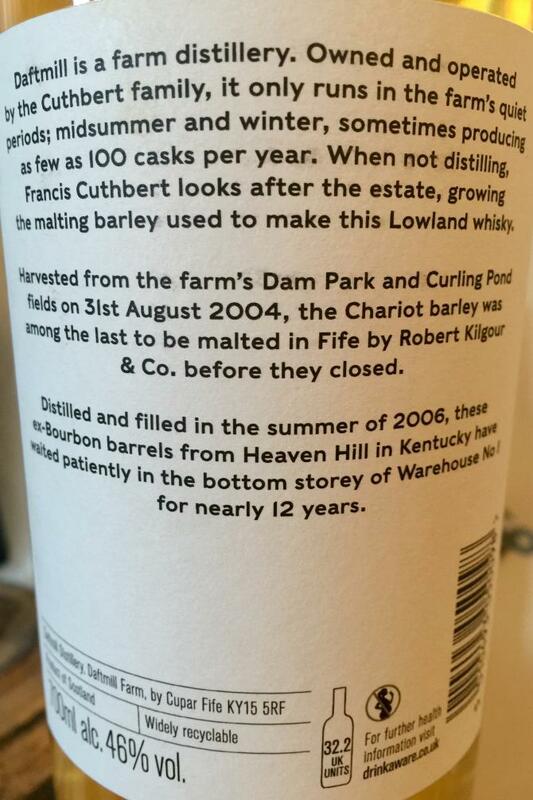 A lot of lovely peaches in this dram though! Finish: Green apples, bananas, Galia melons and apricots… It’s just one big tropical fruit surprise! Balance and Complexity: Well-balanced in both nose and taste, and a tropical fruit bomb in the finish. Comments: Fife has surely put itself back on the map with this dram! 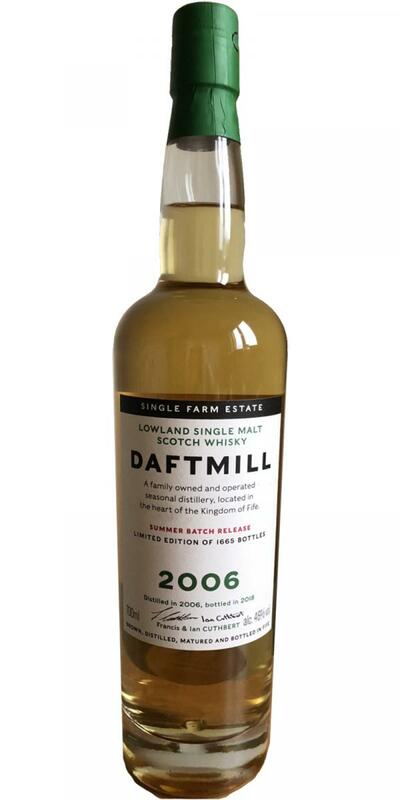 It’s different from other Lowlanders, though it does have similarities with a good yet fruity Rosebank in a very distinctive way. It makes me very happy to see that we weren’t being fobbed off with a bad whisky sold overpriced. This is worth every cent. High standards, high quality, no concessions, very artisanal which by all means makes it very likeable. A stunning modern whisky with extreme quality. This is a distillate forward style however so the casuals won;t understand it and most likely score it lower than it is. Fine by us as it should keep the prices lower too. Maybe I dont understand something, but this whisky on the nose is just like new make. Taste is a little better, but in fact I was really disappointed. The nose reminded me of a rather good Rosebank I reviewed previously, but the palate not so much. Light and floral, with hints of rose petals and peaches, as well as white grapes. There's a touch of mint in the background too, followed by sweet vanilla and cereals, and a good whiff of lemon peel. Very satisfying. Quite spicy compared to the nose, with lots of cloves especially, and some nutmeg too. Hints of cardboard, as well as charred oak. I really do have a hard time retrieving those fruits. Light fruitiness, with lemon at the forefront. Slightly grassy as well, with a bit of menthol. Medium in length. Promising and great nose, the rest doesn't really impress. I might be better a cask strength. Powdered sugar and cantaloupe. Somewhat grassy and Lemon. Thin, some sweetness. Cereal and some caramel. Short, a bit pepper. Some caramel. This is a fairly balanced and tasty summer whisky. Especially the nose sends you on a journey of discovery, but also in the mouth happens quite a lot. Only the departure disappointed. But you also have to give him the time to develop. Notes originally from a blind tasting, slightly adapted in a second pass. After some time, the muffle has settled, but it is not so fresh anymore. Acts now rather balanced. Some butter, grass, still lots of lime, citrus and some mineral, but only a little sweet flavors. When heated, it also shows some vanilla and cotton candy as well as dried herbs. In the mouth, he then starts with dry, will be very sweet in the short term, and then back to dry. The alcohol presses very late. Finally, strong oak with licorice and a hint of menthol. As far as the individual notes are concerned, a lot happens here in a short time. Lemon zest, some floral and cotton candy remain in the memory. The mouthfeel is rather thin. In the finish, he cools the mouth a little longer while he otherwise pretty fast and unspectacular disappeared. Clearly dry.